Sweet romance blossoms between people from two very different worlds. Will the bonds of love be stronger than the bonds of tradition? 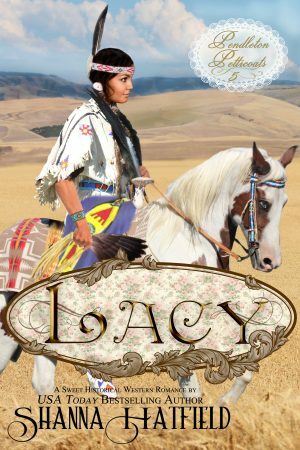 Eager to make her own way in the world, Lacy Williams leaves behind her family on the Umatilla Reservation and accepts a job in Pendleton at the telephone office as an operator. The work she takes in stride, but dealing with the unfamiliar, unsettling feelings stirred by the handsome banker across the street is an entirely different matter. Grant Hill wants a wife. However, not just any wife will do. If that were the case, he’d make an announcement at the mercantile and cause a stampede to the church. Grant wants a woman who will look beyond his material wealth and see into his heart. When he’s all but given up on the possibility that such a woman exists, he runs into the lovely Lacy Williams. The two of them must strive to discover if the bonds of love are stronger than the bonds of tradition in this sweet historical western romance. Intently studying the fullness of his bottom lip and wondering what it would feel like if he kissed her, Lacy’s feet slid on a patch of ice. Grant reached out to steady her. She ended up pulled tight against his chest with his arms wrapped securely around her. His spicy, masculine scent filled her nose and made a delicious tremor race through her. Disinclined to let her go, Grant kept a hand on her waist and guided her to Ilsa’s shop door. “Thank you, Mr. Hill, for all you did for me today. I am most grateful for your assistance.” Lacy lifted her eyes to his. The man’s entrancing gaze pulled her into a place of warmth and security she never wanted to leave. The nearly overwhelming urge to discover if Lacy’s lips tasted as ripe and sweet as they looked created an internal struggle for Grant. He’d never been so attracted to a woman and couldn’t dignify what caused such a strong reaction now. It was ridiculous and unreasonable to be so completely captivated by a woman he’d just met. By sheer force of will, Grant turned and strode away. Lacy gaped after him. She had no idea how long she would have stood on the sidewalk watching his departing form if Ilsa hadn’t opened the shop door and tugged her inside.